Want to read The Roses of May before its May 23 release? Well good news, now you can. Yes, it’s true! Thomas & Mercer is giving away 100 e-copies of The Roses of May on Goodreads. Giveaway is open through April 30th, open to the US (sorry, international readers, it’s a territory rights thing!). Plus, if you have a NetGalley account, keep an eye out for The Roses of May in the next couple of weeks. Once it’s up, you can request a review e-copy. Keep in mind, requesting doesn’t guarantee approval; there’s a whole mess of factors they look at before approving, but it’s still a chance. Guys, we are getting so close, and I am ridiculously excited for you to meet Priya. Get you to Goodreads, and may the odds be ever in your favor! With A Wounded Name out in the world now, I thought I’d do a round up of some of the fun release week stuff that’s out there! First up, my friend Shae has an interview and ARC giveaway up. The giveaway is only for another day, but the interview is forever. Fun note: Shae went to college in my home town, so even though we met through blogging, we very likely encountered each other at the bookstore where I work. Probably multiple times. She asked some really fun questions, and I love her enthusiasm for books. Not just mine- books in general. Authors need (and love!) champions like her. My friend and agent-mate Chelsea Pitcher, author of The S-Word, also has an interview up. The giveaway is closed, but she asked some seriously fantastic questions about feminism and Ophelia. Speaking of feminism, Rhiannon over at Feminist Fiction also has an interview up, specifically asking about the difficulties in a soul-deep feminist telling the story of one of the most famously passive female characters of all time. September is creeping closer and closer! In less than two months, A Wounded Name will be out in the world for all to see! You can even read the first chapter for free. So to celebrate, how’s about a giveaway? There are actually THREE prize packs available! First prize is a SIGNED, HARDCOVER copy of A Wounded Name. It’s so pretty and smooth and did I mention pretty? You can also choose to have this personalized. Also included is a signed swag pack. Second prize is a copy of Defy the Dark, edited by Saundra Mitchell. It has a slew of amazing stories in it, but the reason I selected it for a giveaway is Tessa Gratton’s story “This was Ophelia”. Does that name sound familiar? It should- this is a brilliant take on Hamlet set in all the heady glory of the Jazz Age. I’m a sucker for Hamlet anyway (go figure) and I adore Tessa Gratton’s writing, and this was just a win-win all the way around. This one also includes a signed swag pack for A Wounded Name. Third prize pack is a signed swag pack, enough to have AND to share! 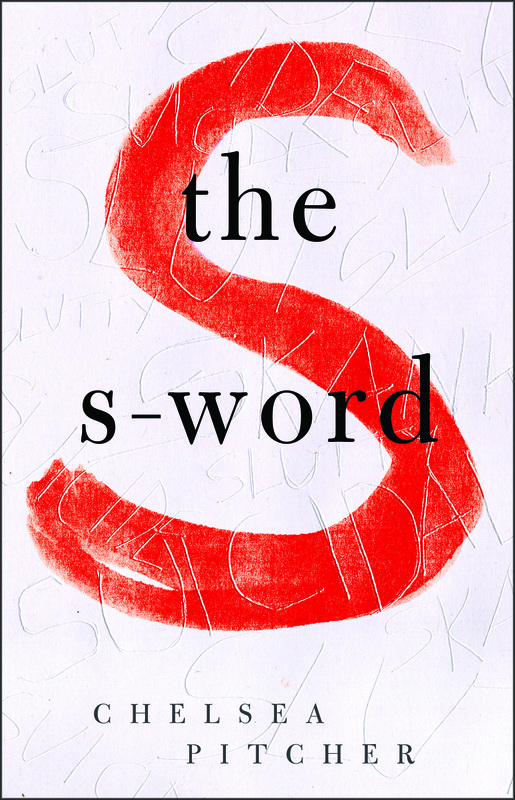 I know I haven’t talked much lately about what I’ve been reading, and that’s because I’ve been headfirst down a drafting hole, but one thing I took a break for was my friend and agent-mate Chelsea Pitcher’s about-to-debut book, The S-Word. And guys, YOU WANT THIS BOOK. It’s mystery and sorrow and friendship and high school, and it’s very, VERY timely. Now, Chelsea has graciously sent me a SIGNED Advance Copy, AND SWAG, including some very shiny buttons, for me to share with you, but the book comes out on May 7th, just around the corner, so this giveaway is going to be fast. Entries will be open through Wednesday, Aptil 24th, so I can contact the winner and get the book sent out by Friday. Entering is super easy- just comment below with a POSITIVE S-Word (like sweet, or smart). That’s all you have to do! Feel free to spread the word (in fact, please spread the word) but all you have to do is comment with a positive s-word, to negate all the negative s-words we throw around at people. Remember, entries are only open through Wednesday, April 24th. I have a thing for prime numbers. Just to let you know, today is the LAST DAY to enter the giveaway for the signed ARC and swag! After this, it’ll be a while before another giveaway goes up, so if you’re not going to BEA (more on that tomorrow), this is going to be your best chance. It’s super easy to enter, and I’ll be drawing a winner tomorrow morning. And, without further business, here’s the snippet! Then it’s time. It’s been time so often today, but it’s time again, this time to close the lid and forever place Hamlet in darkness. The priest places a hand on the sectioned lid, then glances at the line of ravens in the front pew and asks if we’d like to pay our respects. The violet waits patiently in my palm, its fan-shaped petals a little wilted but the colors still true. Claudius goes up first, his face impassive as he studies his elder brother. His face shows nothing, but then, it so rarely does. Claudius is not one to let others know his thoughts or plans if he can avoid it. He doesn’t touch the body, doesn’t even rest his hand on the edge of the casket but, instead, clasps his hands at the small of his back in a vaguely military stance that keeps his spine stiff and straight. Gertrude joins him there, and one of Claudius’ hands floats away to rest on her back. His fingers curve over the small of her back, his palm against the swell of her hip. It’s an intimate stance. I’ve had much occasion over the past three days to study how people touch each other in support: a grip on the shoulder, the forearm, a hand placed gently against the shoulder blades, all things as though they could help the grief stand on its own. It’s too close for brother and sister, as they have been for nearly two decades, and yet there his hand rests, and she doesn’t step away. Her blue eyes glisten, and tears tremble on her lashes but do not fall. She touches her husband’s cheek, leans down to press a soft kiss against his cold lips. Her hand shakes. Dane stands abruptly, yanking me gracelessly to my feet beside him. He stalks up the steps to the altar, jerky as a badly controlled marionette. We pass his mother and uncle on their way back to the pew, and Gertrude’s hand brushes across my cheek in passing. The shiver crawls under my skin. Was it the same hand? From dead flesh to living flesh, could her hand tell the difference? He slowly stands, allows Horatio and me to adjust his clothing, but he can’t look at his mother, can’t share this grief even with her. He jerks his head in what might be a nod, to acknowledge her presence or her words I’m not sure, and walks past her. I cringe inwardly, grateful that neither Laertes nor Father followed her to the alcove. “Thank you for doing this, for him. And…” Her voice trembles, the strength crumbling to reveal the grief beneath. Then she clears her throat, and the moment has passed. “And for Dane. This is especially hard for him.” She links my arm through her. “I’m glad he has his friends to help him through this.” We join the others in the entryway. Father’s eyes show his concern when he sees the flowers in my hair, but no surprise; Laertes must have told him already. Whatever he might say, though, is unknowingly cut off by Gertrude, who again brushes her fingers across the silky petals. Dane’s jaw clenches, as it does whenever he hears his father put into past or conditional tense. Strange, how words can be so precise and yet have so many shades of meaning. Words, words, words, it’s a wonder that they mean anything at all, when so often they don’t. But that is the last said of the violets in my hair. A longer chunk for you today! And don’t forget, for a few more days, you can still enter to win a signed advance copy and swag! Father never needs distractions; he exists in a cacophony of them. Distractions from memory, from fear, from the loneliness he doesn’t know how to let us fill. He never needs more of them, but he looks for them anyway because that is what he does in the name of the making everything run smoothly. I don’t say any of this. I never do. Laertes and I understand Father in very different ways, I think, and I never can decide who has the more right of it. He shakes his head but holds the door open for me. The absence of a scent–a ghost, an echo of violets–follows us into the hall. This is the day Hamlet Danemark V, Headmaster of Elsinore Academy, is laid to rest, and the world mourns. And you can still enter to win an advanced copy, plus signed swag! ARC is US only, but swag is international! Every morning, Jack leaves a small basket of flowers just outside my door, as he’s done for years, as he did for my mother. From the first bloom of early spring to the last bloom of late summer, there are violets. Sometimes other flowers as well but always violets, soft petals ranging from their namesake color through shades of indigo, blue, and heavy cream. He laughed and laughed when I told him of their elusive scent, how smelling them actually makes it impossible to smell anything for a little while, and he knotted a flower into my hair and told me the most beautiful things will always be the most elusive. I was nine years old, my first day back after the cold place, and he’d come to welcome me home with flowers that Jack gave me. Guys, guys, you guys! I got permission to share some lines from A Wounded Name! Over the next couple of weeks, I’ll be sharing bits and pieces from the first few chapters. Want more? I’m also extending the giveaway- you can still enter here, and then you can read ALL of it. Blue like glacier ice, like hidden springs. Blue like jays’ wings, peacock feathers. Blue like my mother’s skin. It isn’t right. Today the sky should be black or deep, roiling grey, a vast, mottled purple bruise overhead. The air should weep, the Heavens pound in anguish and loss, for today we bury the King of Elsinore. But it isn’t. And they don’t. Stay tuned for more sneak peeks, and don’t forget to enter to win an advanced copy of A Wounded Name, plus signed swag!